So after we dropped my mom off at the airport this past weekend, we made a spontaneous stop at the 2nd Street Market in Downtown Dayton. I don’t make it up there on a regular basis, but I thought since we were nearby we’d stop in. I asked Steve how much cash he had on him…and he handed over 18 bucks. I set out to see how much I could get for my $18. I couldn’t have been happier with my first find. See that zucchini up there…it was ginormous. And it was mine…for just $1!!!!! Deal of the day! So far so good…we pressed on and found some other deals. 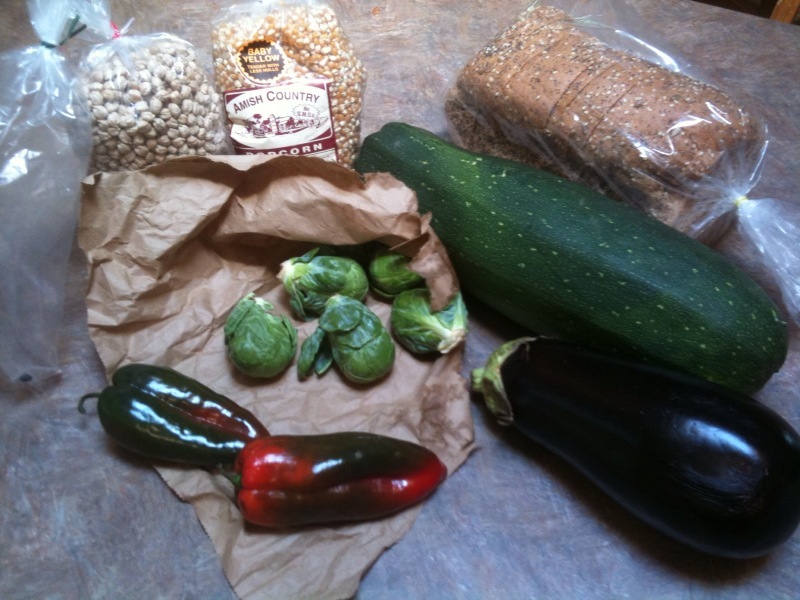 Poblanos for $.50, Brussel Sprouts for about $1, the eggplant for $1, popcorn for $2.50. Garbanzo beans and black beans for $6-ish. Then the bread. I’m embarrassed to say how much I paid for that bread loaf. If you encounter a ginormous zucchini and you’re not sure what to do with it, Amy has quite the list of zucchini recipes that you don’t want to miss out on! Squashes go a long way!! How did you know the zucchini would be good? I can’t believe you got that huge zucchini for $1! That is such a great deal. I’ve never thought about putting zucchini balls in smoothies. Very clever. My mother in law swears you can’t eat the seeds when you shred zucchini. I always thought you could. However, she generally is all things kitchen and knows her stuff so I have doubts now. But I am looking at 6 almost done zukes and have got to know at this point. What is your take? Seeds in or no seeds? 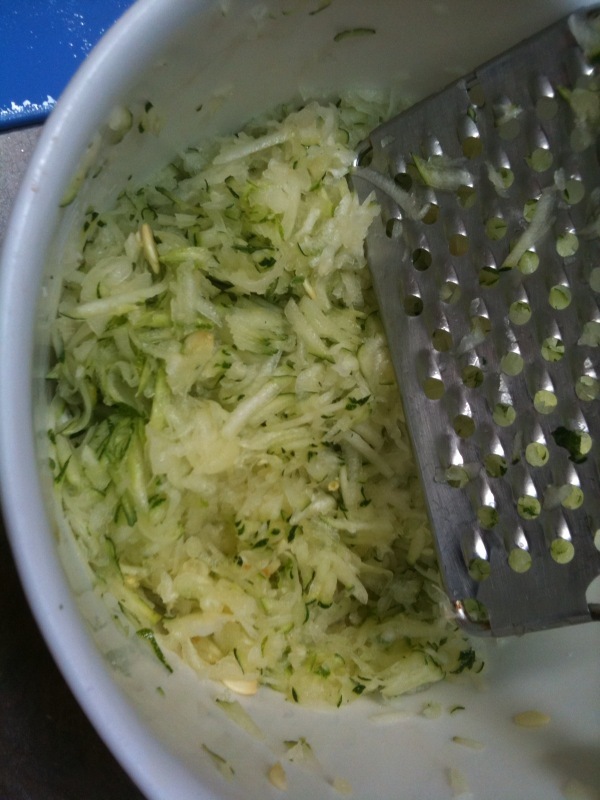 I grated this zucchini by hand and took out more of the seeds…mostly because I was going to bake with the shredded zucchini and knew I would hear it from one of the boys if they found seeds in their muffins! 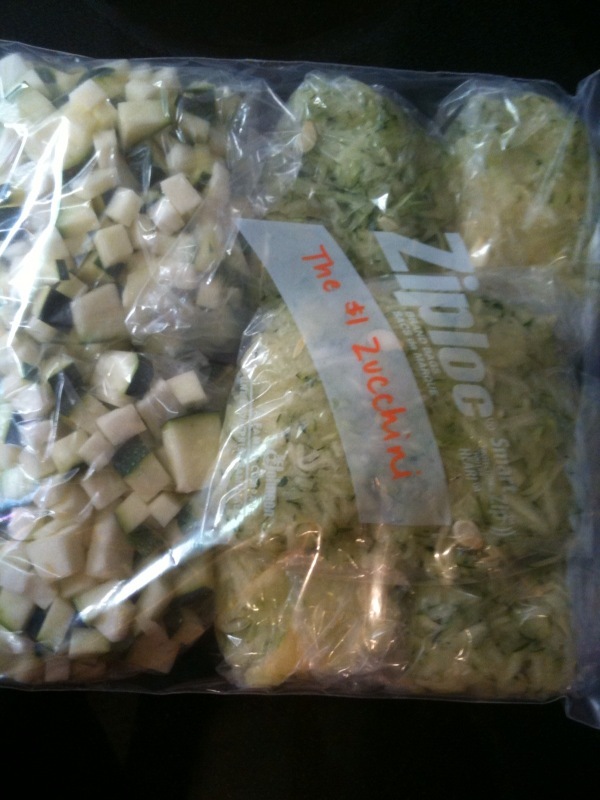 Cooking with the zucchini…or shredding it into a pasta dish or something…it could go either way! Just had zucchini cakes last night using zucchini from our garden! Perfect timing! We just got an enormous zucchini from a CSA box and needed ideas for using it. I don’t think this recipe is frugal nor extremely healthy for that matter, but it does get in zucchini, carrots and raisins…and wheat germ! =) And the muffins are good, too! Fresh baked bread at our farmers market is $5 a loaf. It’s absolutely amazing and my husband loves it, so I always buy it for him, even though it’s crazy expensive! I can cut back other places, it’s worth the price because my husband loves it (and we can afford it), and we’re supporting a local baker! Don’t feel bad! We let our zuchinnis grow that big on purpose. I have trouble getting very many zuchhinis to grow here in the desert. I hear that everyone else has the opposite problem. Right now I have 4 plants but only 1 zuchhini, and I’m letting it get big on purpose. When it’s that big–or bigger–I’ll cut it all up for fried zucchini. We coat it in flour and milk, and fry it in batches. Serve it with homeamde ranch dressing, and that will be our dinner (for less than $1 for the dressing, oil, flour, and salt and pepper–for 7 of us!). Amy–I’ve never had problems with it getting woody, even in our 116º weather. If it does get really big, with hard seeds, you can treat the seeds like pumpkin seeds–and roast them! I live in a desert like area. I use a box garden. They have some organic soil at Walmart that I use. Once the first plant peaks through I put mulch or bark around it. That helps keep the plant moist in the hot sun. With one seed I have had a harvest like you would not believe. Happy gardening. My mom made an “apple” pie out of zucchini for my husband since that is his favorite and he could not tell the difference! Peel and seed the zucchini and substitute for apples in any pie recipe, add cinnamon and you too can be a sneaky vegetable cook. hehe. Love that idea Pat. This was great to come across. I have a harvest of zucchini and this is what I will do today. Cut them up and freeze them. About how much did you put in each bag? Thanks a bunch. I have already cut up one zucchini and it made two, two cup bags. I was worried they were going to waste till I seen this post.